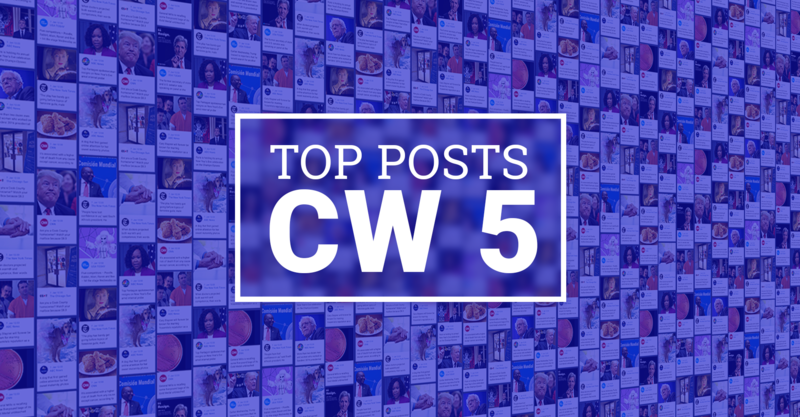 The most successful posts on Facebook last week were marked by musical talents. At the end of the article you will find the complete post rankings by category. Trent Shelton published a video post at the beginning of the week in which he urgently coaches a young woman. The post got nearly a million reactions. Bad Boys 3 is coming out soon! Many users on Facebook shared joy about the news, as Will Smith posted this post with a rich beat. Another post that sounds fantastic. Little Justin plays drums like a real pro. You can hardly look away. 4 Year Old Drummer Justin A Wilson II – LJ . This kid is phenomenal. CBS News posted another musical highlight last week. Two teachers announce in a song that the kids can stay at home due to the cold and snow fall. The Jeep commercial also focuses on beautiful sounds. This fun NFL spot, which features many big players, is introducing the 100th season of the National Football League. Barely 10 hours online, it already received 300,000 reactions. The all-time greatest, most-competitive NFL players gathered for the #NFL100 gala. What could possibly go wrong? Want to find out what the top posts on Facebook and Instagram are about your topics and your industry? With Fanpage Karma Discovery you can easily and quickly create your own rankings. Measured by likes, comments and shares relative to the number of fans. All analyzes have been done with Fanpage Karma. Fanpage Karma is your online tool for analyzing and monitoring social media profiles. Here you can find all brand posts. Kechi Okwuchi will move you to tears! See why Simon Cowell finally gave her the Golden Buzzer she deserved. The teams aren’t the only ones making their way to Atlanta. Let’s start this show, Georgia. “Some people move on. But not us.” Watch the brand new Marvel Studios’ “Avengers: Endgame” spot that aired during the Big Game. See the film in theaters April 26. Here you can find all sports posts. “Amy … you’re our hero.” How a superstar named Amy teamed up with Gary Woodland to win the hearts of the 16th hole crowd at WM Phoenix Open. Here you can find all news and media posts. Six states have considered introducing bills that would allow Bible Literacy to be taught in public schools. Here you can find all posts of personalities. We are not even into February and the cost of illegal immigration so far this year is $18,959,495,168. There are at least 25,772,342 illegal aliens, not the 11,000,000 that have been reported for years, in our country. So ridiculous! After all that I have done, does anybody really think I won’t build the WALL? Done more in first two years than any President! MAKE AMERICA GREAT AGAIN! Here you can find all posts of fun pages.